1 - Sometimes while recording with MLV the camera gives an error. The message is something like "card/filesystem error". The card is formatted inside camera (exFAT, from what I remember). Everytime it happens I have to restart the camera (most of the time removing batteries). 2 - The Auto-ETTR module uses the "SET" button, the same as the MLV module, so there's incompatibility between the two. 3 - Dual ISO doesn't seem to work in movie mode, even though the MLV module is loaded. The message (in orange) says: "Dual ISO does not work in movie mode on your camera". 5 - A slight magenta 'corruption' in the midtones. I'm sure it's not a WB issue or chromatic aberration. I'm processing with MLVProducer, so it could be a bug on post-processing, haven't tested on other software. 6 - The maximum resolution is 1568px? When I try to reach a higher resolution it gives me the message "[resolution] is not possible in current video mode (max 1568)", so when I return to a lower resolution it goes to 1536px, instead of the supposed maximum 1568px. It doesn affect the functionality, it's just a bug it seems. I can send the log files and a MLV sample if needed, just ask here and I'll do the upload. - The 10bit doesn't seem to be supported on 50D, right? - Is it possible to have the optimal ISO values on the "ADTG experiment" without compiling it from scratch? I've tried to run the ISO research modules, didn't work. My 50D is out on loan at the moment but I'll answer a couple of your questions. 1. I have not had this happen personally. Have you tried different cards? Carefully cleaning the contacts etc? 2. I think you can re-assign the record button!? 3. Dual ISO does not work for raw video in the 50D. 4. You can fine tune shutter settings but I don't get exactly 180 degrees either. It's either slightly more or slightly less (I choose slightly less). If very much doubt you can tell any real difference in cadence and motion blur against something shot with a shutter at exactly 180 degrees. And, in some 'pro' cinema cameras, although it may say 180 degrees on the settings screen they too can be one way or the other depending on the internal clock frequency. 5. It's likely not just in mid-tones but that's where you're most likely to see it. It could be CA or white balance. Try other apps for processing first. The white balancing algorithm in some apps can cause magenta contamination (I have seen it happen with raw footage in in Resolve) so that's where I would put my money. If its happening across multiple apps then try shooting a repeatable test without any tint offset being set in camera, try a different lens with a different focal length, try a UV filter, basically try everything you can think of in camera then try all the apps again. 6. Sounds like a bug. re: 10bit (and 12bit) it is not supported in the nightly builds (yet) but there are some working 10/12bit builds for the 50D. https://bitbucket.org/daniel_fort/magic-lantern/downloads/. re: ISO values - no. For that you would need to find them using the ADTG build then edit and compile your own build. It may be possible with a script but I don't have a clue there. The module posted on the download page is suppose to run on the crop_rec_4k branch which the 50D can't do--yet. I compiled a build for you and put it on my downloads page. I'll keep it up for a few days or until you let me know that you've got it. A few notes on those missing features that might make you feel a little better. 3. Raw video Dual ISO isn't working on several cameras. I think it might be a Digic 4 thing, IDK. However, if you could shoot video with Dual ISO you might not like it because it adds aliasing artifacts on top of the aliasing that is already inherent on these DSLR cameras. It is fine with still photography because you're using the full sensor resolution but at video resolution the Dual ISO artifacts are very noticeable. 4. Don't get too hung up on getting an exact 180 degree shutter angle. A few "professional" film cameras don't even have it. Ok, well maybe the better ones do for example the Arri 16s has 180° while the Canon Scoopic 16mm has a 170° and the Bolex H-16 has a 135° shutter. Some film cameras have variable angle shutters and the Panaflex Millennium can even vary the speed while adjusting the angle so the exposure remains the same. Though I doubt you're going to trade in your 50D for a Panavision to get that feature. 6. Yeah, that seems like a bug. Could you please write up exactly how to reproduce it and post it on the issue tracker? Finally, the 50D users that have tried my 10/12bit experimental build have reported good results. It still needs more work but you are welcome to try it out. Please report your findings on the 12-bit (and 10-bit) RAW video development discussion. waza57 explains here how he found the registers , I would think the process should be repeatable with all digic iv cams specially 50D as it's the 5D2's little bro . However, if you could shoot video with Dual ISO you might not like it because it adds aliasing artifacts on top of the aliasing that is already inherent on these DSLR cameras ........ but at video resolution the Dual ISO artifacts are very noticeable. Where it shines the best is in 3xCrop mode with 10bit (old dec/'16 build) but I really don't use it that much . Regarding Dual Iso movie for 50D there is an old post of tecgen. This could be a starting point. Another missing feature is flexinfo. I made a pull request that enable it on 50D. Current issue is the flicker ofelements inside the center part of the screen. Also occurring with console screen (See below). B3. Console's windows is flickering in Photo display screen. Yes, you're right. I just find it annoying when I get ~178 degree instead of 180... maybe it's some psychological stuff. 5. It's likely not just in mid-tones but that's where you're most likely to see it. It could be CA or white balance. It's not CA because it's happening not only on the edges and probably not WB too, because I've adjusted it many times. I checked the black point and sometimes it's off... maybe the software guesses the wrong BP? Try other apps for processing first. The white balancing algorithm in some apps can cause magenta contamination (I have seen it happen with raw footage in in Resolve) so that's where I would put my money. If its happening across multiple apps then try shooting a repeatable test without any tint offset being set in camera, try a different lens with a different focal length, try a UV filter, basically try everything you can think of in camera then try all the apps again. I've tried on Rawtherapee (extracted from MLV with mlv_dump) and MLVApp. I compiled a build for you and put it on my downloads page. I'll keep it up for a few days or until you let me know that you've got it. I'll see if I can post there. The reply above to @Andy600 has a link for a screenshot: basically when you reach above maximum resolution and then you go back not "<=" res. you don't get the maximum, but the value below maximum (1536px). @reddeercity can you explain what's de difference between 3xcrop and normal MLV recording? I've read @a1ex input on it and tested myself, but I can't see much difference between the two, except for the fact that 3xcrop has more noise and, well... it's cropped. With Full Frame 1:1 you will or may experience aliasing and moiré pattern not so in 3x crop that the advantage . you can record 1920x1038 23.976 14bit @79MB/s in 3xCrop , bit reduction just give you longer record times at higher rez. If I had a 50D I would only record in 3xCrop (better to more resolution(1920) and little noise then less resolution(1536) ) you can always eliminate/fix noise with dark frame in post. Wow, great. I didn't noticed that I could record 1920px in crop mode. Thanks for you reply. The problem is not the white balance unless you used As Shot or Auto. I dialed in WB at 3850k (no tint) for a reasonably neutral balance but you won't get it precise without knowing the lighting or having a gray/white card target in the shot. On the scopes it looks like you're also using a film lut or film look preset too? That is adding some heavy saturation to reds and magenta. The lut/look is also clipping highlights (quite badly) in the other shots and there's some unpleasant banding in the highlights. I would suggest trying to grade the look yourself or try a different lut/look but I see no significant problems with the DNG. Thanks Andy600. I'm using AlexaLog and then AlexaLog to Rec 709 LUT (from Arri website) on Lumetri. It still gives me pink midtones. Also, the highlight clipping happens all the time too, it is difficult to get a bright image just going +3 f-stops only on midtones, since it create a bad saparation between tones (maybe the banding comes from this)... well it's just my inability to grade properly. The image you linked above seem to have wrong WB (too warm), maybe that's a point to consider too. I suspect 'AlexaLog' is only the Log-C curve (1D) so if you're using an official Alexa 3D lut that transforms both the gamma and gamut from Log-C to Rec709 you will get these types of color problems. You need to know the gamut that the image is in before applying a specific technical 3D lut or you are only compounding your problems. If you don't know the gamut it is safer to use only a 1D lut to get from Log-C to Rec709 and then add your own color correction (before the lut). This also assumes also that 'AlexaLog' is actually using Log-C math and that there are no colorspace or levels issues in the app. 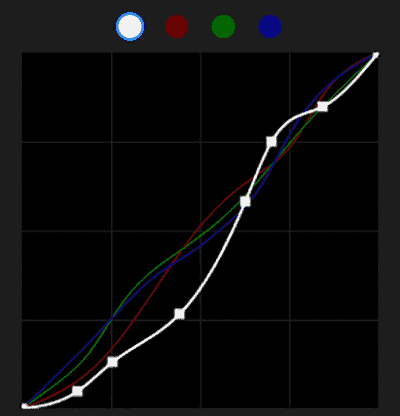 Also, you really need to know which Log-C curve is being used because it changes relative to exposure. The default as used in most NLE's and color grading apps is EI800. Where can I find AlexaLog? I'll check it when I have some time. Re: WB. Maybe. I didn't do any grading, only set a WB. I'm going only by what I can see on a vector scope and there is no neutral target in the shot. The model has a pink complexion and the beautician/make-up artist is more of an olive color so cooling WB will tend to make the pink hues more blue and less life-like, especially under mixed lighting. If I were grading this I would certainly be using qualifiers to isolate and treat the different skin tones independently. Try doing a basic grade without a lut and see if you still get clipping. +3 on mid-tones is quite extreme and yes, will likely cause some banding, especially if done after the lut. Why are you pushing mid-tones so much? Are you using Lumetri in Premier or After Effects? Yes, I suspected it was more complex than I thought. Try doing a basic grade without a lut and see if you still get clipping. +3 on mid-tones is quite extreme and yes, will likely cause some banding, especially if done after the lut. Why are you pushing mid-tones so much? Thanks. Indeed, the noise reduction (NeatVideo) is way too strong. Do you know which ARRI lut you are using exactly? If you're unsure you can send me it or tell me the parameters you selected in the LUT generator and I'll check. If it's the full transform then there's your main problem. Your footage is in BT.601 or BT.709 (there's no bt609) and you are transforming it as if it were in a much wider gamut. This will not only cause over saturation but hue rotation because the primaries lay on a different axis and, because the gamut is a lot smaller than Alexa Wide Gamut, you're also likely losing some color information when rendering to Prores 'AlexaLog' in MLVApp. The matrices are originally from Adobe. MLVApp looks to be writing a single matrix (D65) which should be ok for most daylight shots but white balance accuracy would be improved a bit if it also included the tungsten matrix. You can get decent results with Lumetri. Try using secondaries and, if necessary, multiple instances of Lumetri to isolate and grade problem parts of the image (after your primary grade). I think the #1 piece of color related advice I would give is to always shoot a reference/target. A simple grey card can be very cheap and once you have that in shot you have a reference for exposure and white balance. I would say it's essential for any commercial shoot and most casual shooting really benefits from it. Try adjusting the contrast pivot point lower if possible. Alternatively try increasing overall gain/exposure then pull down shadows and rolloff highlights i.e. a classic s-curve. This should give a more natural look. Yes. I have a rule with NR and that is to only use it if it's really necessary and then use as little as possible, limiting it to whichever channel(s) the noise is most apparent i.e. R,G,B or Luminance. Neatvideo is extremely good but is very easy to overcook if used as a broad stroke across everything. I also tend to limit sharpening to luminance or use highpass filtering on skin but that's always subjective. Your welcome I'll check out MLVApp's color when I get bit more free time. Do you know which ARRI lut you are using exactly? It's the "AlexaV3_K1S1_LogC2Video_Rec709_EE_aftereffects3d". Parameters are Photometric Scaling, LUT Dimension 65^3 mesh and Bits set to default. If you mind, do you have any resource where we can get this matrice for tungsten? Yes, I notice the need of grey cards now shooting RAW. With H.264, for 6 years, I never needed that, because I wasn't having such fine controls over the footage. Cool. This technique of gain-then-curve is new to me. I agree. Or, if necessary, use dithering/grain after NR. I just don't know how it assign each matrix. Through MLV metadata? I've found mlv metadata not to be so reliable (in the past... don't know if anything changed in past year). Does it include a colorspace conversion? Ok after a very quick look through it looks as though the full set of Adobe matrix coefficients are there (in camera_matrices.c) but only the second matrix (D65) is assigned. It also shows a Dx0 matrix for the 5D2 (is this used for everything?). The Adobe DNG SDK has everything needed for raw color all in one place so it escapes me why devs continue to cherrypick non-standard info from the internet. It must be a coding thing!? Another pet peev of mine is XYZ colorspace being assumed to have a D65 whitepoint (as with that xyz2rgb matrix). XYZ colorspace, as referred to in Adobe DNGs and ICC profiles and most apps built on ICC, has a D50 white point and all the math uses D50 with chromatic adaptation where necessary to change the white point. You have to be very careful to not mix up D50 and D65 matrix math or you will get the wrong colors. I'm not saying that's what's happening here but there is a mixture of methods in use and I would have to pick through the code to see how it's working. You could add it manually with Exiftool, override it with a DNG profile in ACR or ask the dev to enable it. The actual difference to color is usually very small (but can be more with certain lighting) but the second matrix is preferable for white balancing non-daylight sources (as with your footage for example). The Log-C math looks correct but where and when does it get applied? Is it in float or int and before/after colorspace is assigned. This can all make a difference. AlexaLog should match Log-C in other apps (at least the gamma part because MLVApp is limited to sRGB primaries from what I can tell). The white balance multipliers are Canon's and wouldn't be relevant to DNGs if the app utilized the SDK. Adobe's white balancing is IMO far superior and more importantly, neutral but it's a bit more complicated to implement. 'camera_matrices.c' was long time deprecated. Also only 5D2 matrix is used in master branch for all cameras. This is the file which is used by WhiteBalance branch now. All matrixes for all ML supported cameras there (2 color matrixes and 2 forward matrixes) are from Adobe. However Ilia is experimenting a lot with this branch and there is some problem with multiplier deriving function which is not working properly for temps lower then 4000K. My bad for linking wrong info. is not working properly for temps lower then 4000K. Did you compile and use the Whitebalance branch, bouncyball was talking about? The master branch works good also for 3000K (maybe also less, but I never used that), at least for 5D2 clips. I'm using release binary, haven't compiled (yet). No. It's not that simple unfortunately. Technically speaking it's D50 but would be observed as green on a display because of the bayer pattern. The color matrices describe a transform from XYZ (D50) to non-white balanced camera RGB. The D65 part only references how the color calibration was performed i.e. D65 is a calibration under a daylight illuminant (~6504K) and Standard A is under a tungsten illuminant (~2856k). The sensor behaves differently depending on the spectral power distribution of the light source hence why it's a good idea to have 2 calibrations under different temperatures. So... when that image in XYZ is transformed to sRGB (for viewing) it will be the same as having the white balance slider set to ~5000k in a raw converter and looking at it? And it makes a lot of sense that the sensor would respond differently at lower colour temperature, never thought about that before. But I'm a little confused as to what the temperature of ColorMatrix1 (the ones we have in ML code) is... where do I find out? Not exactly. A CIE white point isn't yet assigned but you can theoretically assume it is (or later will be) D65 white because the temperature of the illuminant under which the calibration is taken/made is ~6500K. DNG math works in XYZ space (CIE D50 white or little x 0.3456 little y 0.3585 big Y 1.0000) so the color matrices need adapting to D50 to make DNG WB math work. CameraRGB doesn't have a defined white point other than what the calibration illuminant dictates, there is a point in the matrix where R,G and B would = 1 so this is used as white. That depends entirely on the raw converter and how it calculates/interprets white balance. CameraRGB is not itself neutral and you will be viewing it on a monitor, likely to be using a D65 white point (so the wp should have been adapted for it) and there are white balance multipliers to factor into it which control the slider so the app slider should reflect the as shot color temp (there will likely be a difference in what the WB is interpreted and displayed as depending on which method of white balancing the app uses).